Huffington Post published this list of open neo-Nazi and white supremacists running for office. HuffPo includes a number of assholes who are also white-supremacy-adjacent, as well. Some cowards simply use the dog-whistles and encourage the ideas of racism, while not posting photos of themselves in SS-esque outfits complaining about Jewish folk. 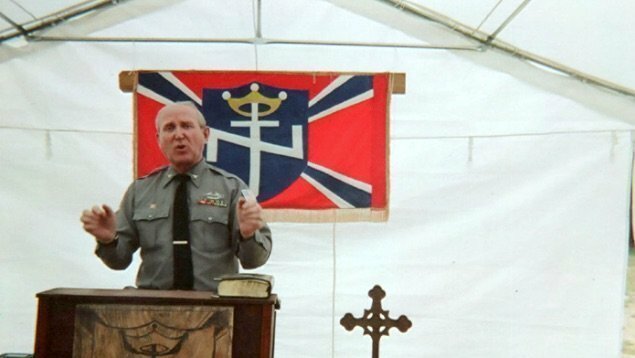 There are at least three white supremacists currently running for Congress, and a fourth running for a state House seat. Two other candidates — one of whom can unambiguously be called a white supremacist, and one who has ties to white supremacist groups but denies being a white supremacist himself — announced runs for public office, but have since dropped out of their respective races. Still more Republican candidates, many of whom are running for re-election, have used white supremacist slogans, invited white supremacists to official government events, or granted interviews to racist or anti-Semitic publications. It’s important to identify these candidates, not only so people know who’s on their ballot, but because ― as we’ve seen ― someone who’s thought of as fringe one year can be in the White House the next.